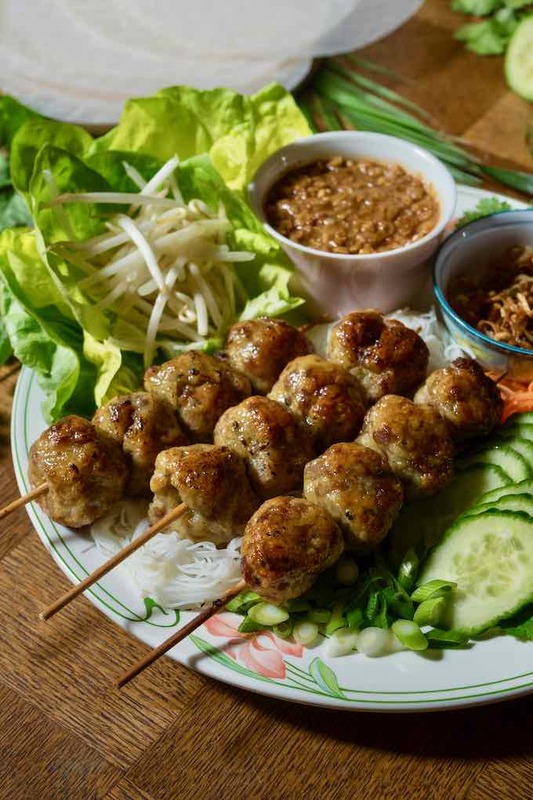 Nem nướng is a Vietnamese dish made from meatballs or pork sausages skewered and grilled. 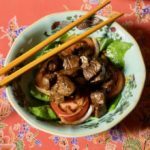 This preparation is strongly flavored with garlic and fish sauce. The presence of sugar brings a sweet and slightly caramelized aroma that is very pleasant. 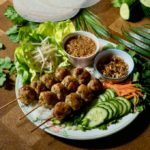 People accompany these skewers with rice paper wrappers that each guest can garnish at will with raw vegetables and vermicelli, and dip in a peanut sauce. The whole thing is quite refreshing and filling, and the assembly stage makes it a very convivial dish to share. The meatballs or sausages are a mixture of chuck and brisket to create a balance between the lean and fat parts of the animal. Nuoc mam (fish sauce), sugar, black pepper, salt, yeast and roasted rice grains are added. These ingredients are crushed for a long time in a mortar until a very smooth and homogeneous mixture is obtained. The shaped dumplings are then skewered, and grilled in the oven or barbecued, which gives them a grilled taste that is very specific to nem nướng. The sauce is made from crushed peanuts. 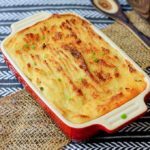 They are added to fried onions and garlic. Then, the chicken broth is incorporated with the hoisin sauce and nuoc mam, and everything is mixed until the sauce is smooth, dense and homogeneous. 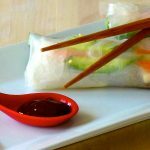 The different elements that constitute the spring rolls are prepared separately, including the rice paper wrappers and the raw vegetables such as cucumbers, scallions, cilantro, bean sprouts, salad and pickled carrots. Rice vermicelli are added, and then the fried shallots and the sauce. From there, each guest can prepare their fresh spring rolls to taste. 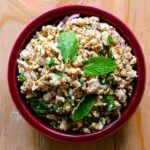 Generally, people start with a rice paper wrapper, to which they add salad, raw vegetables, cilantro, and then fried shallots, bean sprouts before finishing with the meatballs or sausages that are cut in half lengthwise. The rice paper wrapper is rolled and can be enjoyed by dipping it in the sauce. What is the origin of nem nướng? Nuong nem is typical of Ninh Hoa, a city in the Khánh Hòa province, in the central and coastal part of Vietnam. In Vietnamese, the word nem refers to “minced pork”. 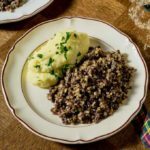 And it also refers to several dishes that are quite different from each other but all containing this minced meat. Nem ran (fried roll), nem chua (a dish made from fermented pork meat and pork rind rolled in the shape of a large sausage) or nem bi (meat, rind and herbs). When you go to Vietnam, it is necessary to be precise when you order nem. As for the word nướng, it means “grilled”. 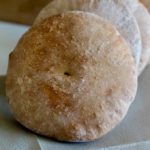 What are the other versions of nem nướng? There are all kinds of spring rolls in Vietnam. According to Bùi Thị Sương, author of a book on these, there are at least 76 varieties that differ depending on the Vietnamese regions, the south, the center or the north of the country. 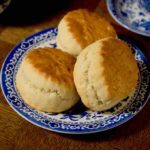 The difference comes from the filling, but also the shape, as well as the size. Gỏi cuốn or nem cuốn are what we often call fresh spring rolls, i.e. not fried. Nem nuong can be attached to this category when they are served as nem nướng cuốn. 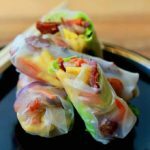 In general, these contain raw vegetables, rice vermicelli, shrimp and/or pork that are rolled in a rice paper wrapper (bánh tráng). Very close to nuong nem, with only the filling and presentation that differ. They are also served already rolled. 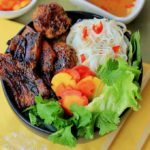 When it comes to nem nuong, the meat preparation may be in the form of meatballs, sausages or patties, but always grilled or baked. Crispy fried rolls or daikon are sometimes added as an accompaniment. Sometimes, the ingredients are rolled in a salad leaf, without the rice paper wrapper. People can therefore enjoy nem nuong in the form of spring rolls or by combining the elements in a plate. The latter shared similarity with the bun cha from Hanoi. Bò bía, also Vietnamese, is a fresh spring roll. It contains dried shrimp, eggs, jicama, green salad, carrots, garlic, and Chinese sausages. Everything is also rolled in rice paper wrappers. It is called popiah in China, Thailand and Malaysia. Chả giò, cha nem or nem ran are fried. They also exist in several variants, including with pork, chicken or crab and/or shrimp. They are also prepared with rice or soy vermicelli, fresh herbs and raw vegetables. These are a festive dish in Vietnam and they also were a popular dish at the imperial court of Nguyen. 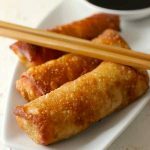 In this last category of fried spring rolls, let’s not forget the traditional Chinese spring rolls, the Indonesian or Filipino lumpia, the Japanese harumak or the Korean chungwon. 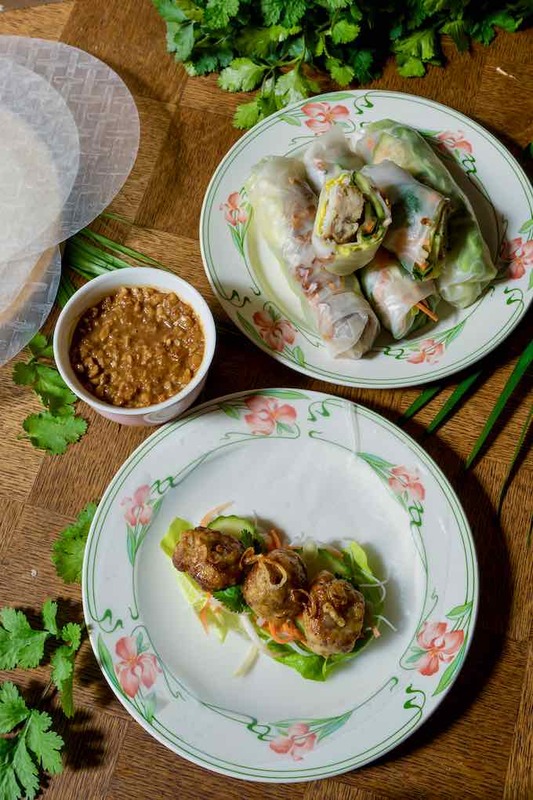 Nem nướng is a popular Vietnamese dish that consists of grilled pork meatballs or sausages that are served with rice noodles and in rice paper wrappers. Peel the garlic, chop it coarsely, then transfer it to a mortar. Pound until obtaining a paste. Add all the meat and, using the pestle, pound several times by mixing it with the garlic. Using the pestle, pound hard for 10 minutes. Season the meat with salt and pepper, incorporate the yeast, the roasted rice powder, the nuoc mam sauce and the sugar. Mix well and let stand for 1 hour. In a wok, heat enough peanut oil to cover the shallots and fry over medium heat. As soon as the shallots start to brown, drain them in a colander so that they remain crisp. Set aside. Let the shallot frying oil cool, rub your hands with it, and make meatballs by rubbing your hands regularly with the shallot frying oil. Firmly place the nem nuong dumplings on the skewers. The meatballs should not rest on a flat surface when cooking but on a rack, as they should not bathe in the cooking juices. 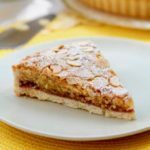 In a mortar, add the roasted peanuts and crush them finely, without turning the peanuts into peanut butter. Heat 2 tablespoons of peanut oil in a Dutch oven and over low heat, add the onions. As soon as they start to brown, add the garlic. As soon as the garlic starts to brown, add the crushed peanuts. Stir constantly for one minute. Then add the chicken broth, obtained either with a cubed broth or with the reduced broth of a chicken or its carcass. Then add the hoisin sauce and the nuoc mam sauce. 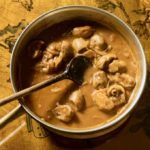 Remove from heat, and mix in a blender in order to obtain a homogeneous sauce by also adding the onions, garlic and peanuts. Set aside. Prepare a wood fire or light the electric or gas barbecue at a temperature between 300 F and 350 F.
Brush the grill with peanut oil. Place the meatball skewers on the grill. The cooking of the meatballs should be slow. Once the meatballs are cooked, browned on the outside, and soft inside (about 15 minutes), let them rest for 5 minutes under foil and near the heat source. Preheat a convection oven to broil at 300 F.
Arrange the skewers in the center, making sure that they do not cook in their cooking juices. Use skewers or a baking rack with a broiler pan underneath. Bake for about 15 minutes on one side then turn and cook another 15 minutes. Increase the oven temperature to 400 F during the last 5 minutes of cooking, to accentuate the formation of a crispy surface. Wet the rice paper wrappers with lukewarm water, and arrange them on a large damp cloth without overlapping them. Set aside. On the side of a large serving dish, arrange slices of cucumbers and scallions, cilantro, and pickled carrots. Arrange the well drained rice vermicelli in the center of the dish and place the meatballs on top. In a bowl, add the crispy fried shallots that will be incorporated into the fresh rolls. Serve the sauce in small individual bowls. Chili paste and roasted peanuts can be added, to taste. - Place the rice paper wrapper on a dish. - Place a piece of salad on it. - Add the cucumber and cilantro. - Add the fried shallots. - Add the bean sprouts. - Cut the meatballs in half and spread them over the length of the rice paper wrapper. 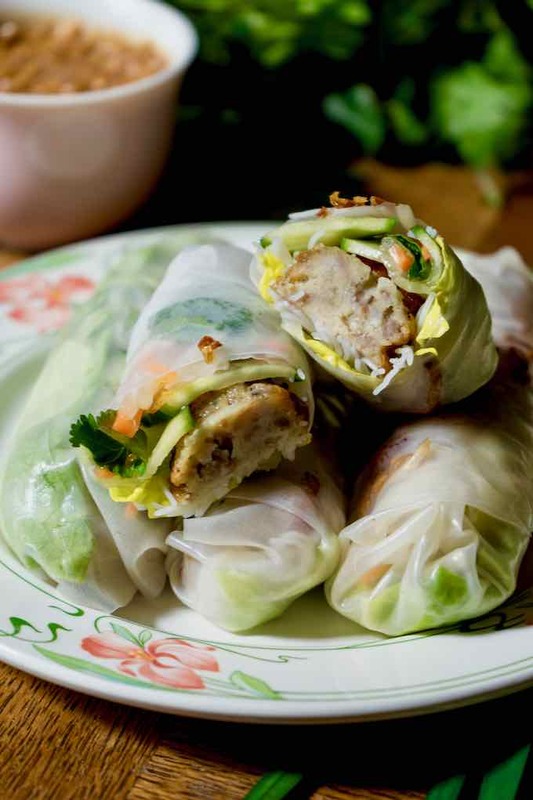 - Lift one side of the rice paper wrapper and roll everything. Close the sides to seal the roll. - Dip in the sauce to taste.